In the early part of the twentieth century, when transatlantic travel was at its zenith, the ocean liners themselves were owned by just a few companies. 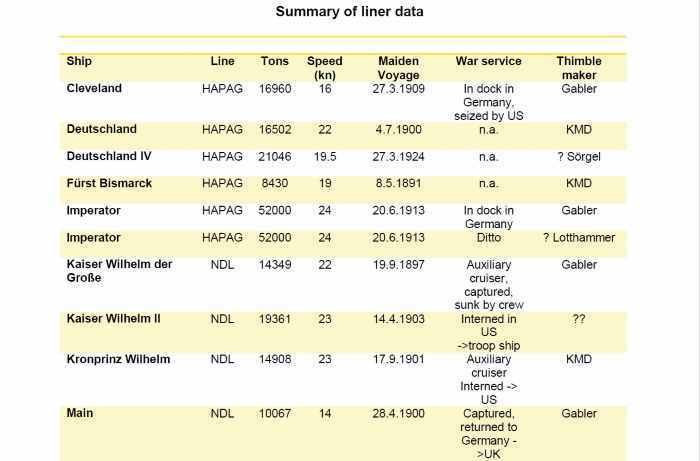 Two such companies were the German companies Hamburg-Amerikanische Packetfahrt-Actien-Gesellschaft (HAPAG) and Norddeutscher Lloyd (NDL). 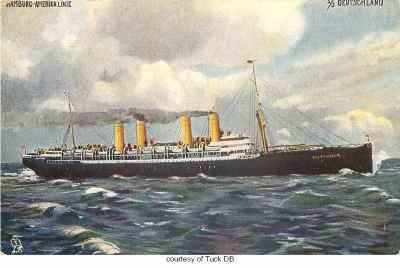 At their busiest they boasted two Atlantic crossings a week and vied with each other to take the Blue Riband, an unofficial accolade given to the fastest liner making the transatlantic crossing on regular service. 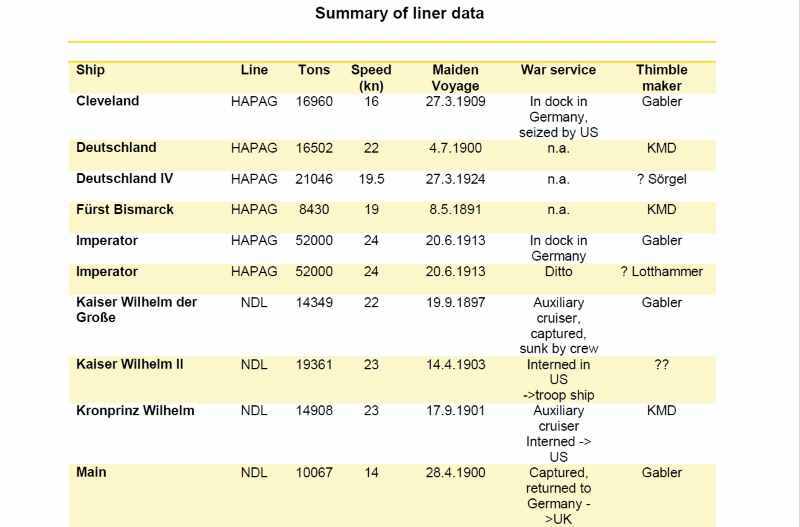 Later HAPAG and NDL merged to become HAPAG-LLOYD. 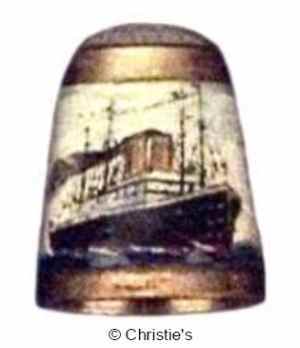 At about the same time, Ketcham and McDougall (KMD) and Gebrüder Gabler, each, designed series of enamelled thimbles which depicted the boats and which were, presumably, sold on board the early transatlantic liners as souvenirs since they did not bear dates signifying a commemoration of any particular event. Souvenirs were sold by barbers from cases in their shop. Examination of deck plans confirmed that whilst the boats did have barber and cigar shops they did not seem to have gift shops. Gifts were, however, on display in glass cases in the foyers of the boats and passengers wishing to purchase souvenirs had to contact a steward or the barber who would then obtain the item for them (personal communication, J B Hawley - www.luxurylinerrow.com.). 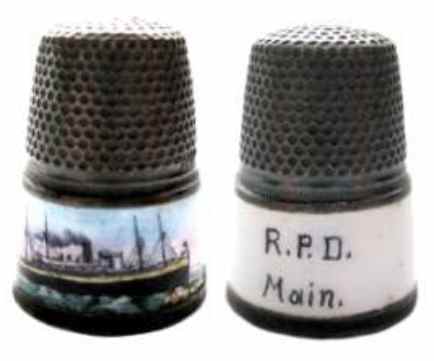 We don't know how many different "Ocean Liner" thimbles were made and no records are known to list the thimbles. 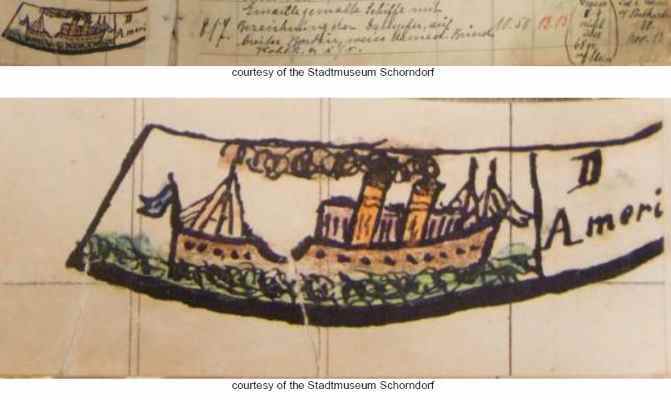 In an early Gebrüder Gabler workbook, however, a design for such a thimble is drawn and described ("D Amerika" -1905 -1958) but no specific ships are mentioned in the text. 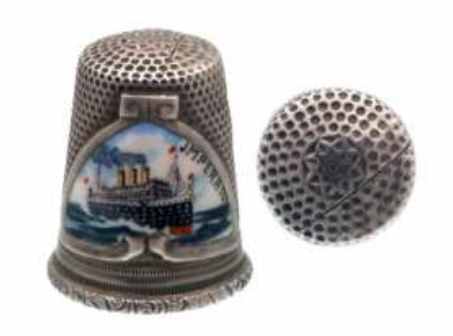 The Gebrüder Gabler thimbles have enamelled borders with a painted image of a ship and a white enamel rectangle with the name of the ship. 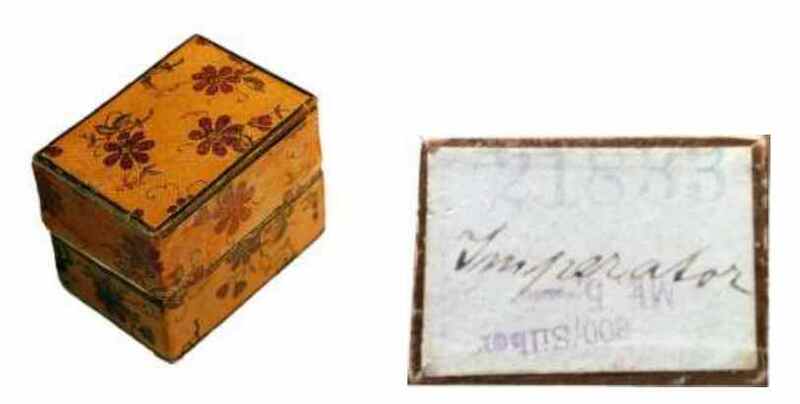 The thimbles seem to have been sold, on board, in plain boxes with a stock number, the price and the name of the boat marked on the underside. 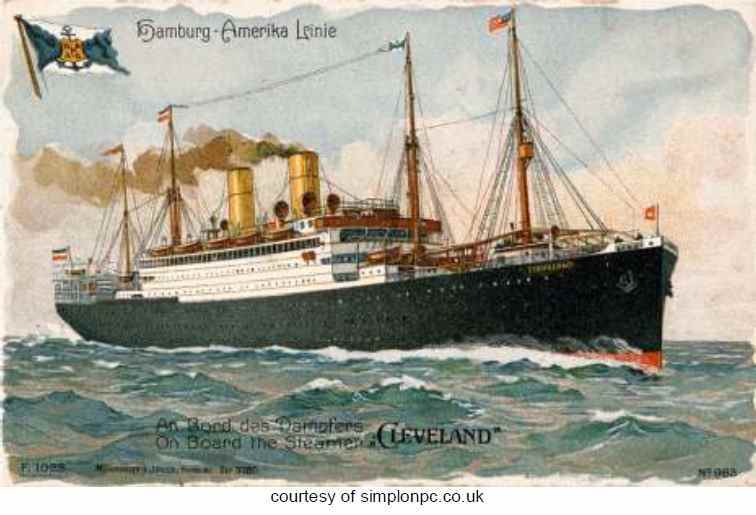 The "Cleveland" made her maiden voyage on 27th March 1909 from Hamburg to New York. She continued in the Hamburg - New York service until the outbreak of the First World War. She remained in dock in Hamburg through the war. After the war ended she was seized by the U.S. government, changed her name to 'Mobile' and served as a troop ship. In 1920 she was sold to the Byron Steam Ship Company and renamed "King Alexander". The ship was sold again in 1923 to the United States lines and was named "Cleveland" again. She was used for passage between Hamburg and New York. Finally HAPAG bought her back in 1926 and she continued with her Atlantic crossings for a further five years before going into dock in 1931 and being scrapped in 1933. 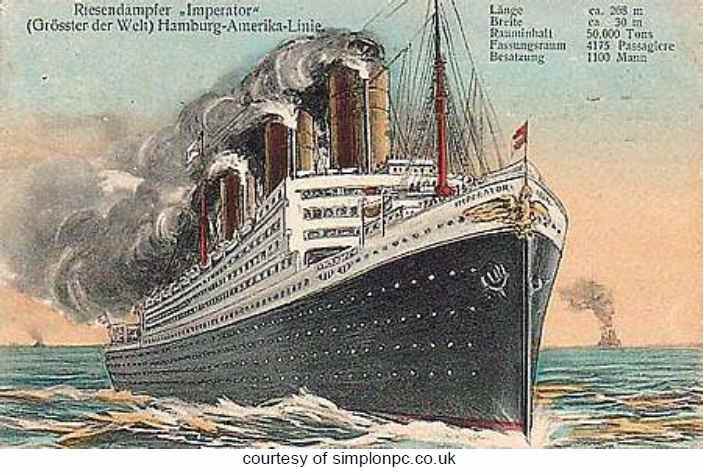 The "Imperator" was built in Hamburg and launched on 23rd May 1912, the "Imperator" was the largest ship in the world until "Vaterland" (see below) sailed in May 1914. By October 1914, the "Imperator" was back in the shipyard because of handling and stability problems. The centre of gravity of the ship was found to be too high so the marble bathrooms and the heavy furniture in the first-class sections of the ship were removed. The height of the funnels was reduced and cement was poured into the bottom of the ship as ballast. During the First World War he (see "note" below) was laid up at Hamburg and remained inactive for more than four years. After the war, he was briefly commissioned as the "USS Imperator" and employed as a transport. 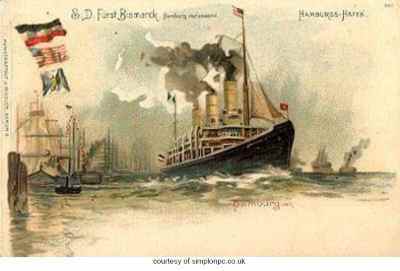 As part of the post war reparations he was handed over to Cunard and renamed "RMS Berengaria" for the final decade of his life as a ship. "note": Although in German, as in English, ships are usually referred to as feminine, "Imperator" was referred to as masculine at the special request of Kaiser Wilhelm II. 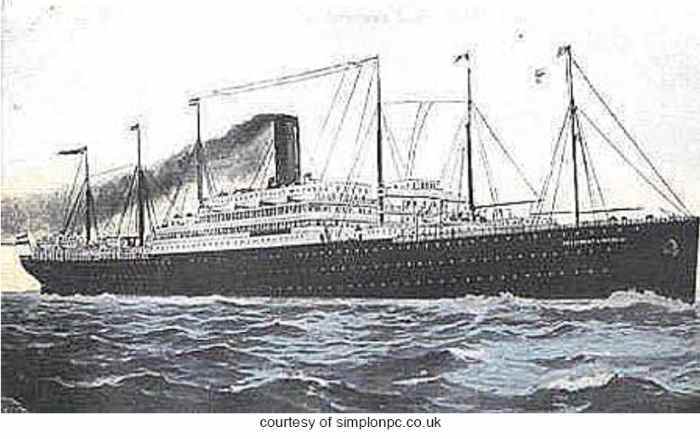 The "Kaiser Wilhelm der Große", the first major NDL ship built for the North Atlantic crossing, was the first four-funnel liner to be built, and was probably the first great liner to have been represented on a thimble. She was the first ship to have been equipped with a Marconi wireless radio system. Her maiden voyage began on 19th September 1897 from Bremerhaven to New York. The following year she gained the Blue Riband for transatlantic crossings in both directions. In 1900, she escaped a major fire in New York Harbor. In the winter of 1913/1914, the "Kaiser Wilhelm der Große" was taken out of regular service and rebuilt. She undertook her last Bremen-New York crossing in March 1914. She was then converted into an auxiliary cruiser in which state she was able to sink several allied ships. She was loading coal near Rio de Oro in Spanish West Africa, was identified by a British warship, asked to surrender, refused and was scuttled by her crew. She was salvaged in 1952. 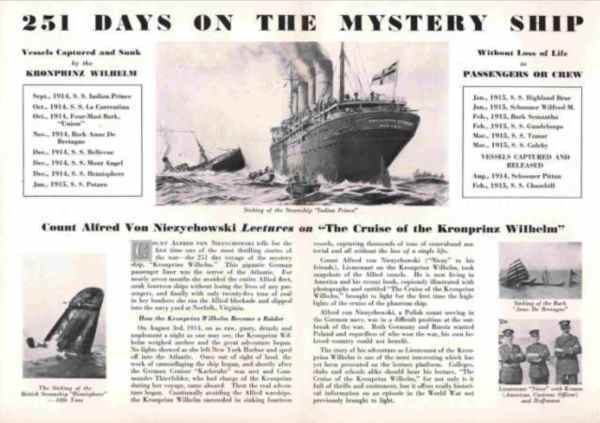 The "Main" made her maiden voyage from Bremerhaven to New York on the 29th April 1900. On 30th June 1900, she was caught in the Hoboken Docks Fire. She was unable to escape her moorings, was completely gutted and sank. Sixteen "coal trimmers" who had survived the fire hiding in a coal bunker, were amazingly able to crawl out of the hulk. On 27th July she was refloated and sent for repair. After about fifteen months she re-entered normal service. In August 1902, she made her first trip from Bremerhaven to Baltimore and in June 1914 she took her last trip from Bremerhaven to Baltimore. Subsequently she was confiscated by the Allies in Antwerp, but in October she was returned to Germany. Following the war, on 21st May 1919 she was awarded to the British Shipping Controller in reparation. In 1921 she was handed over to the French government, laid up and scrapped four years later. The "President Lincoln" was built by Harland and Wolff in Belfast and was launched on 8 October 1903. The ship was originally built for another shipping company but the order was cancelled and the unfinished ship was bought by HAPAG. She was named "President Lincoln" by HAPAG and, on 1 June 1907, undertook her maiden voyage from Hamburg via Boulogne and Southampton to New York. She was the world's largest cargo and passenger liner at the time. During the First World War the ship was "interned" in New York and then taken over and used as a troop ship. She was sunk in May 1918 by a U-boat when she was on a return trip from Cherbourg. In her heyday she could carry up to 3828 passengers, only twenty-six people lost their lives when she was sunk. 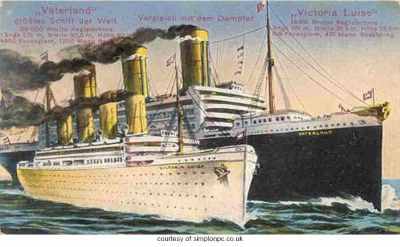 The "Vaterland", was the sister ship to the "Imperator". Built in Hamburg the "Vaterland" was the largest passenger ship in the world upon her completion. She made her maiden voyage on the 14 May 1914. She sailed for less than a year before the start of the First World War. She was laid up in New Jersey and remained immobile for nearly three years. In 1917, she was seized by the U.S. government and renamed "Leviathan". She continued, first as a troop ship and later as a passenger liner, crossing the Atlantic between the US and Europe until 1934. 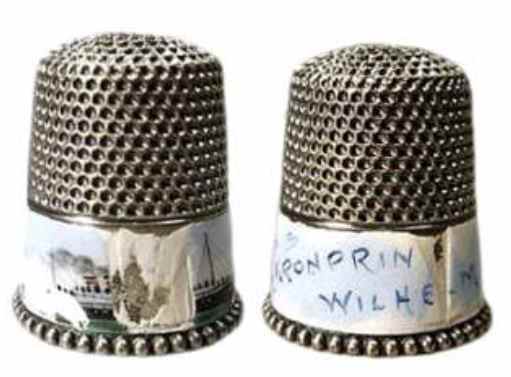 There appear to have been two versions of this thimble, one by Gebrüder Gabler which has a similar design to the other Gebrüder Gabler ship thimbles and one possibly later also made by Gebrüder Gabler. The "Victoria Luise" was originally built in 1900 and named the "Deutschland". The "Deutschland" made her maiden voyage on the 4 July 1900. 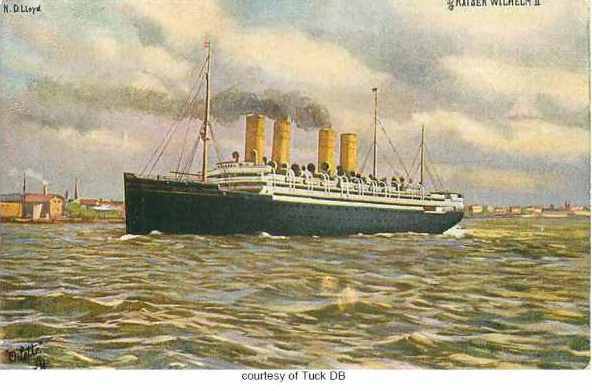 She was renamed, in 1910, the "Victoria Luise" and was one of the first dedicated cruise liners of the 20th century. She cruised in the Caribbean, the Mediterranean and in Scandinavia. She remained in Germany during the First World War but at the end of the war all German ships were surrendered. "Victoria Luise", however, was in such poor condition that she remained in Germany. By 1921 she had been refitted extensively and went back to the transatlantic route renamed as "Hansa", where, as the "Deutschland", she had previously won the "Blue Riband" (see below). She was the second four-funnel ship in the series. Ketcham and McDougall (note KMD use "SS" before name and not "D"). 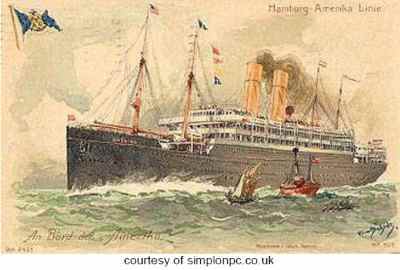 The "Deutschland", the only four-funnelled liner in the HAPAG fleet, made her maiden voyage in 1900 and won the Blue Riband both ways. She suffered from engine vibrations and in 1910 she was retired from transatlantic service. 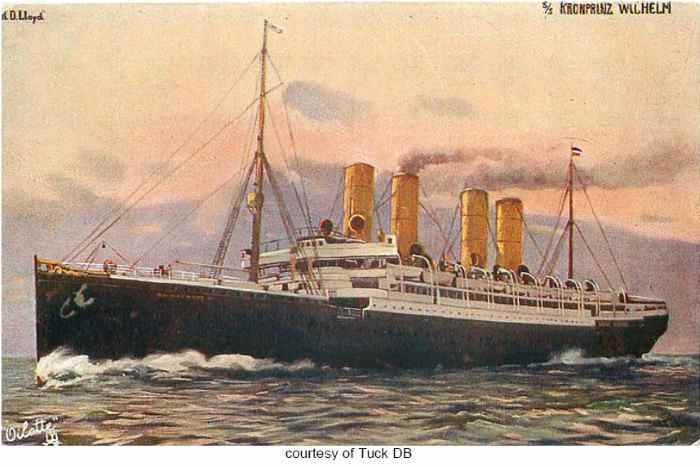 She was refitted and renamed "Victoria Luise" (see above). The "Fürst Bismarck" was one of a quartet ("Fürst Bismarck", "Kaiserin Auguste Victoria", "Normania" and "Columbia") of liners built for HAPAG during the latter part of the 19th century. Her maiden voyage from Hamburg to New York commenced on 8 May 1891. Later in the year she won the Blue Riband. With all four ships, HAPAG was able to offer weekly departures to America and "Fürst Bismarck" was the last, largest, and fastest of the quartet. In March, 1894, she sailed for the first time from Genoa and Naples to New York and stayed on this route during the winter months. Due to an outbreak of cholera in Hamburg passenger numbers fell drastically. When the Russian Navy in the war against Japan urgently needed troop carriers and auxiliary ships, HAPAG sold the"'Fürst Bismarck" in July 1904 along with two of her sister ships. The "Fürst Bismarck" was renamed the "Don". In 1907 her name changed to "Moskva" and in 1909 she was sold to the Austrian government, underwent conversion to a "mother ship" and was renamed the "Gaa". She served destroyers and later submarines during the First World War. The vessel was seized by Italy at the end of the war, rebuilt and renamed "San Giusto". She was scrapped in Italy in 1924. 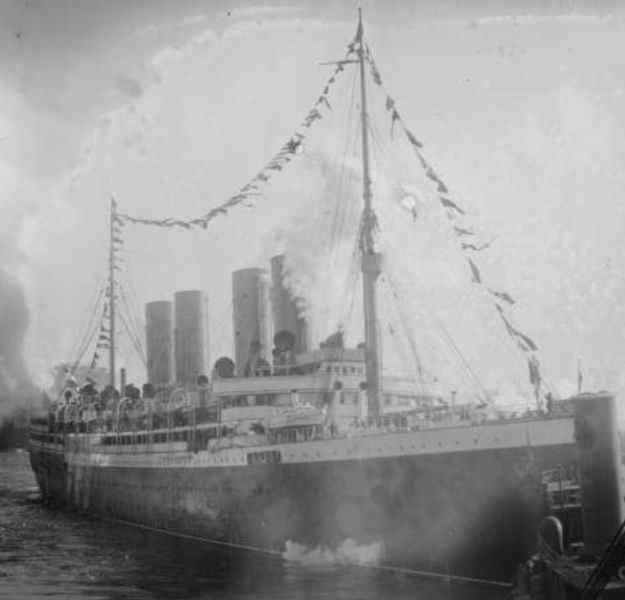 The "Kronprinz Wilhelm" was the second of four, four-funnelled ocean liners ("Kaiser Wilhelm ll", "Kronprinz Wilhelm", "Kaiser Wilhelm der Große" and "Kronprinzessin Cecilie") to join the NDL fleet. She was very similar to "Kaiser Wilhelm der Große". 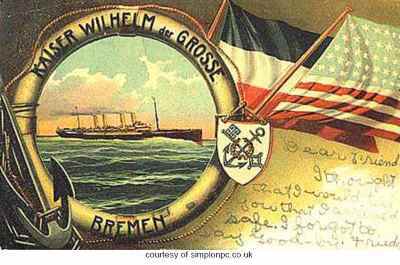 Her maiden voyage to New York was from Bremerhaven on the 17 September 1901. A year later she broke the record for the east west crossing of the Atlantic. She seems to have been accident prone; ramming and sinking a British freighter with the loss of two lives, and colliding with and severely damaging the destroyer "HMS Wizard". The "Kronprinz Wilhelm" made her last transatlantic crossing in July 1914. She left New York on the 3 August to meet with the German cruiser "Karlsruhe" near the Bahamas where she was converted into an auxiliary cruiser. She was to assist in the blockade of the South Atlantic. In eight months she captured and sank fourteen ships and not a single life was lost. 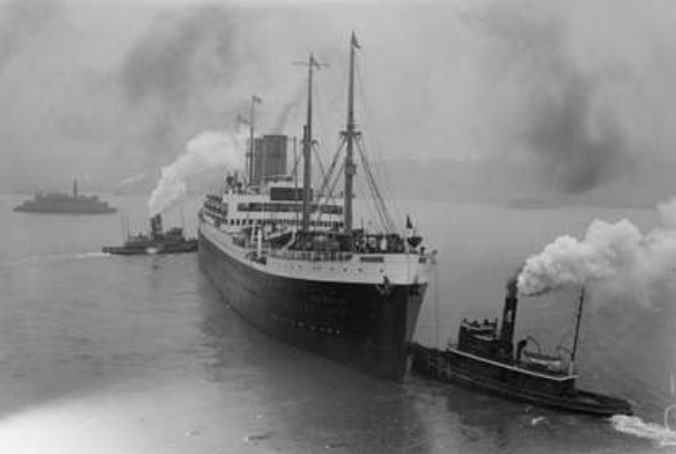 The "Kronprinz Wilhelm" loaded coal and supplies from the ships that she captured in order to avoid internment if she were to enter an American port. Shortages of food and coal did eventually force the "Kronprinz Wilhelm" into port and in April 1915 she dropped anchor in Newport. She was interned for two years before being renamed "USS von Steuben" and being refitted as a troop carrier. On her first voyage after her refit she was to have yet another accident when she collided with her sister ship the "Kaiser Wilhelm ll" which had also been interned. Both ships continued to France despite their damage. She was to remain a troop carrier until late 1919 and was scrapped in 1923 alongside her sister ship "Kronprinzessin Cecilia". The "Deutschland lV" was one of four ships built by HAPAG after the war to serve on its transatlantic service. Her maiden voyage was in March 1924. She was refitted with new turbines and boilers in 1924 and until the outbreak of the Second World War she reliably sailed in the transatlantic service. She served as a barracks ship, a residential ship and in 1945 she assisted in the evacuation of the eastern German territories as the Red Army moved west. Close to the end of the war she was converted to a hospital ship but was sunk by RAF bombers whilst in her berth in the Bay of Lübeck. We think that this thimble may have been made by Sörgel und Stollmeyer, Schwäbisch Gmünd. The "Kaiser Wilhelm ll" was the third of the four, four-funnel, liners built for NDL. She was named after the German Emperor. She left Bremerhaven for New York on the 14 April 1903 on her maiden voyage. Like her sister ship, the "Deutschland", she too had problems with vibrations at high speeds and a year after her maiden voyage her propellers were replaced. She then won the Blue Riband for the fastest eastbound crossing. She sank whilst taking on coal in Bremerhaven in 1907 and was withdrawn from service for several months. In June 1914, "Kaiser Wilhelm II" collided with the British steamer "Incemore" in thick fog off the Needles, but she managed to return to Southampton despite being holed below the waterline. On 28th July 1914, she made her last transatlantic voyage and on her arrival in New York she was interned and then commandeered. 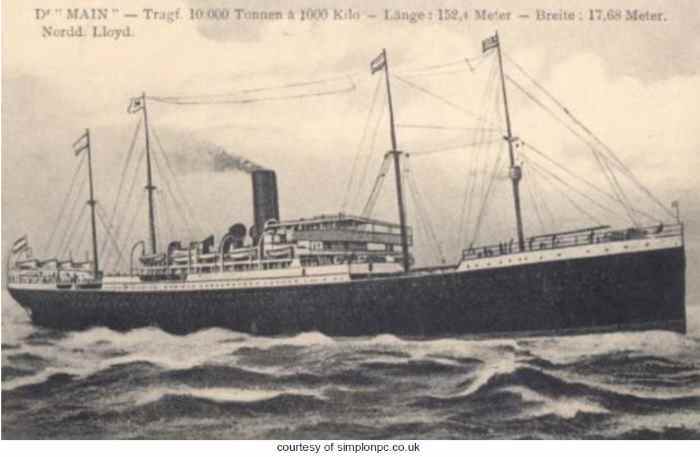 She was renamed "USS Agamemnon", converted into a troop-carrying ship and on her first crossing to France was involved in another accident, this time, with her sister ship the "Kronprinz Wilhelm". She continued to move troops until she was laid up in the middle 1920s. She was renamed the "Montecello" in 1927 but had no more active service. She was subsequently considered unfit for use and was scrapped in 1940. The last of the big four NDL ocean liners was the "Kronprinzessin Cecilie". We are not aware of a "Kronprinzessin Cecilie" thimble and this is not easy to explain. Ketcham and McDougall seems to have made the other four-funnel liner thimbles and although the "Kronprinzessin Cecilie" was the latest ship to be launched, and did not remain in service for long before being interned, one would have expected that there would have been a souvenir thimble of the ship somewhere? We have been able to discover a souvenir spoon with an enameled picture of the boat so we think there must be a thimble? We think that this thimble was made by Lotthammer - Stützel, Pforzheim. 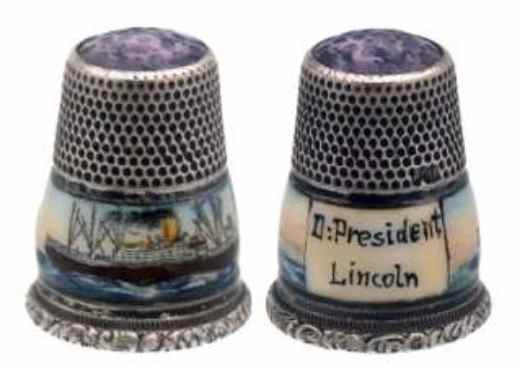 The enameled ship thimbles were made when transatlantic ocean liners were at their busiest. 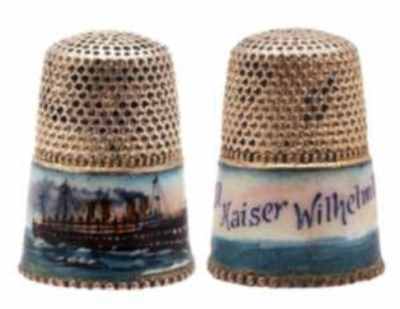 Both HAPAG and NDL, at one time or another, boasted the biggest and fastest transatlantic liners and it was probably not a coincidence that Gebrüder Gabler and KMD made thimbles representing them. The onset of the First World War resulted in all the HAPAG fleet being interred so that the ships and their thimbles were only available for a very short time (1900-14). Some of the NDL ships were converted for war. For this reason it seems probable that there are only a few ocean liner thimbles in existence. 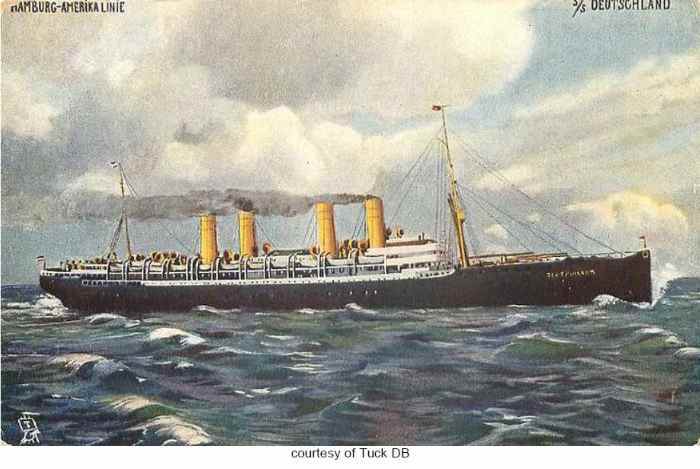 The last big HAPAG ship, the "Bismark" never sailed with passengers before the onset of the war so it seems to be unlikely that Gebrüder Gabler would have made a thimble for this ship. After the war, the surviving ships were not sailing under the German flag. 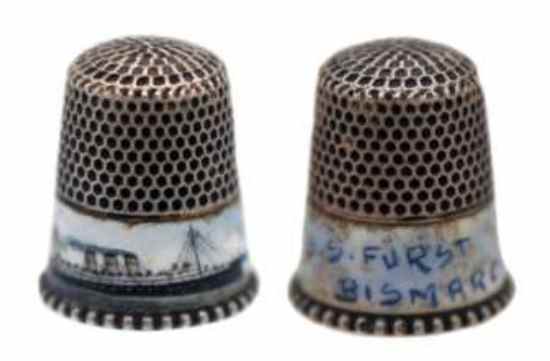 The earliest ship launched and to be recorded on a thimble was the "Fürst Bismarck" which made its maiden voyage in 1891; the thimble was made by KMD. 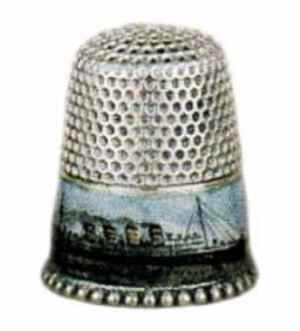 It may thus be that KMD was the first thimble maker to make such a thimble. 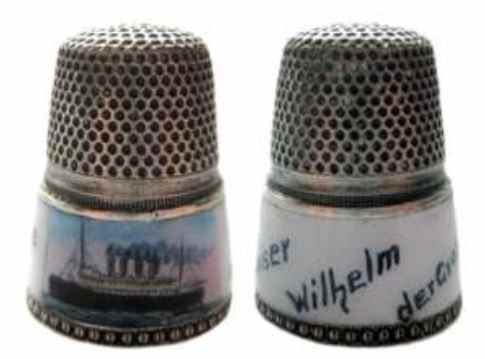 KMD were soon to be copied by Gebrüder Gabler who made a thimble for the "Kaiser Wilhelm der Große", a ship who made her maiden voyage in September 1897. 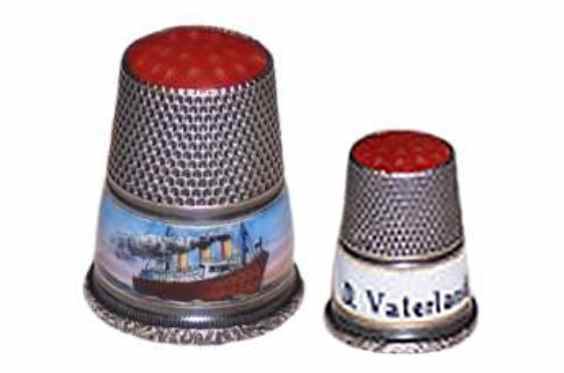 Both thimble makers made thimbles for both shipping companies. All the big German four-funnel liners were recorded on thimbles with the exception of the "Kronprinzessin Cecilie" which was the last to be launched, possibly too close to the outbreak of war? We think that it is unlikely that there were many other enameled ship thimbles made by Gebrüder Gabler or KMD at the beginning of the twentieth century because there were no other major HAPAG or NDL transatlantic liners in service. 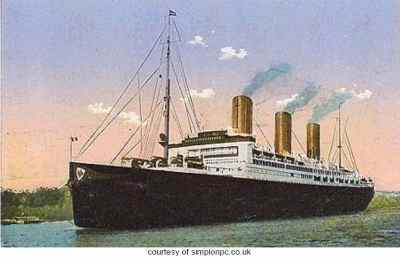 Had the First World War not been declared there might have been thimbles on sale on the "Bismark" or the "Kronprinzessin Cecilie" and also any other HAPAG or NDL liners which were yet to be and no doubt would have been built? 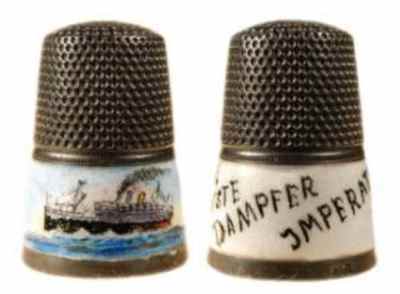 The declaration of war, the confiscation of HAPAG and NDL ships and the sinking of NDL ships resulted in no more thimbles being made. 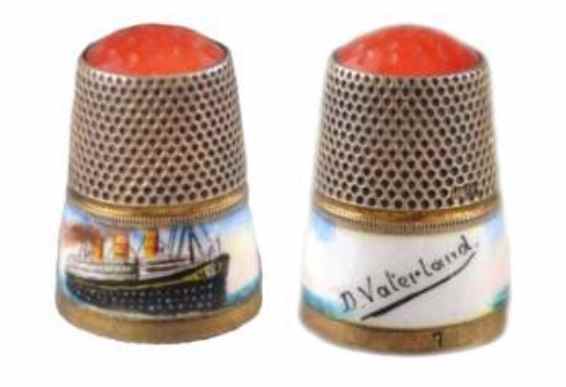 Despite the short duration of service of these transatlantic liners prior to the outbreak of war, one could conservatively calculate that, even if only one thimble was sold during a crossing and each liner might make twenty-six transatlantic crossings in a year and be active for at least seven years, there should be at least over 100 thimbles for each ship somewhere. Although we have only been able to identify a few of these ship thimbles, we think that the sample size is large enough for some conclusions to be drawn. At a time when transatlantic travel was at its peak before the First World War, two large thimble makers, one in the USA (KMD) and the other in Germany (Gebrüder Gabler), produced silver, enameled thimbles depicting ocean liners to be sold as souvenirs on board the respective ships. The American and German thimbles can easily be distinguished because the Gebrüder Gabler thimbles always had a white enamel rectangle which contained the ship's name. It was continuous with the rest of the enameling but nevertheless quite distinct. The lettering was in black. Some lesser thimble makers did also make these sorts of thimbles but it is difficult to be sure which thimble makers they were. 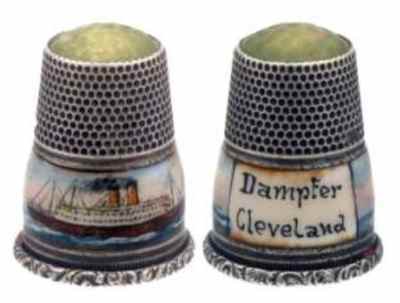 Both major companies made thimbles for HAPAG and NDL but they do not appear, for some unknown reason, to have made thimbles for other transatlantic shipping lines. We think the thimbles were made in the early part of the twentieth century rather than at different times for each ship (maiden voyages were sometimes more than seven years apart) because the silver thimble design itself was very similar. 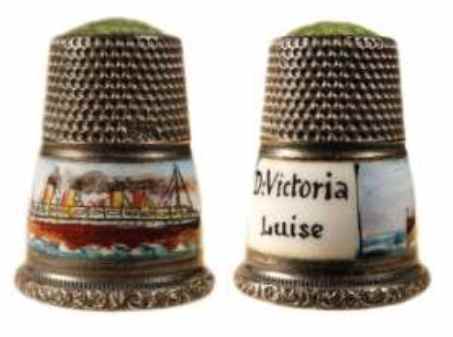 We conclude that the commencement of the First World War had a significant effect on these ocean liner thimbles. We believe that they are now somewhat rare and much sought after. We are very grateful to Mrs Irene Schwall, Mrs Wynneth Mullins and Mrs Elizabeth Waciorski for providing images of thimbles known to them and Christie's for allowing reproduction of one of their images. We also thank Wolf-Dieter Scholz for providing images from the Gebrüder Gabler work book and critiquing the text. We would like to thank Mr Ian Boyle (simplonpc.co.uk) for help with most of the boat images, the remainder are in the public domain.